The Italian Men’s Volleyball League imposed penalties to four players involved in an incident at the end of Game 3 of the playoff quarterfinals, two days ago. 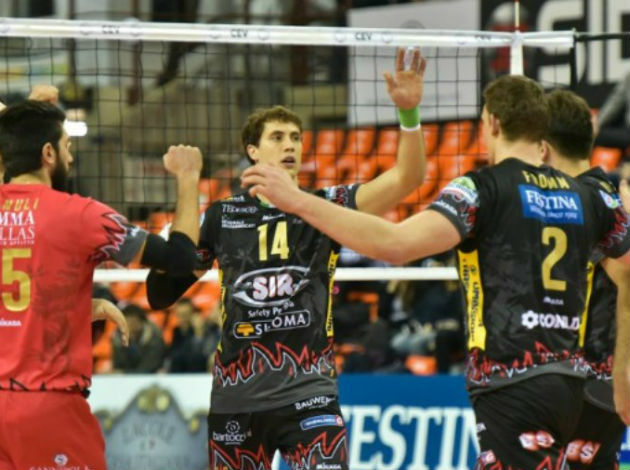 At the end of Game 3 of the 2018/19 SuperLega Credem Banca playoff quarterfinals between Sir Safety Conad Perugia and Vero Volley Monza, the incident occurred while players shook hands at the net. Santiago Orduna, the Argentine setter from Monza, spit Serbian Aleksandar Atanasijević from Perugia. The opposite hitter than tried to physically attack Orduna but was held back by his teammates. For this, Orduna earned an eight-game suspension from SuperLega, which he will do next season, while Atanasijević was suspended for two matches, which means that he will miss Game 1 and Game 2 of the semifinals against Azimut Leo Shoes Modena. Also, Perugia middle blocker Fabio Ricci got a one-game suspension while another Monza player, the Czech Donovan Džavoronok, earned a two-game ban. Both were punished for involvement in the same incident (video). 5 Comments about "ITA M: Italian League suspends Atanasijević for 2 games, Orduna banned for 8 games (VIDEO) "
That is not fair since Perugia is in Play-off. But i am wondering what happaned for spitting, this should not become football match. NO!!! This is awful news for Perugia! I wonder what Atanasijevic did to make Orduna spit on him. Modena is in a really good place to take 2 matches. Perugia paid a fine for Ricci, so he's going to be on court, and Atanasijević's suspension has been reduced to one match.